In February, with the worst of winter possibly yet to come, birds are faced with a dual pressure. The first stirrings of mating behaviour are being felt; if you look at the male house sparrow’s bill it is turning black again as his testosterone starts to build up, and his black bib is getting more noticeable to help him attract a mate. By the end of the month tawny owls could already be sitting on eggs. A second pressure is still the need for a sheltered roosting site to survive the long nights. So in a giant, industrial-scale glasshouse somewhere in Kent, where strawberries are grown all year round, hundreds of pied wagtails slip through the vents each night to roost together among the plants. That little bobbing, black and white bird hunting scarce insects in your garden during the day could just be one of them! Like the wagtails, many birds are still gathering in flocks to roost or find food, and are easily trapped. So it is a good opportunity to gather scientific data about their lives by collecting body measurements to gauge their health and fitness, and fitting a tiny ring with a unique number that will identify them as an individual if they are caught again, or found dead. They are then released unharmed. 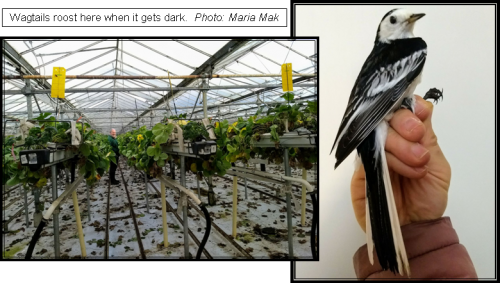 The pied wagtail in the picture was trapped at roost in the glasshouse, measured and ringed, then kept in a safe place overnight to be released at the greenhouses the next morning none the worse for his experience. Enlightened arablle farmers ensure some stubble fields are left unploughed through the winter for the birds to forage in when natural resources are used up. As the populations of most of our farmland birds have declined, in some cases up to 90 per cent, in the last fifty years, some farmers are now paid extra to grow a special crop like sunflowers to leave as overwinter food for them. One such farmer is Peter Hall in Marden, where huge numbers of birds are drawn to his fields for food. Flocks of more than five hundred chaffinches and bramblings (a winter visitor from Scandinavia) are common. 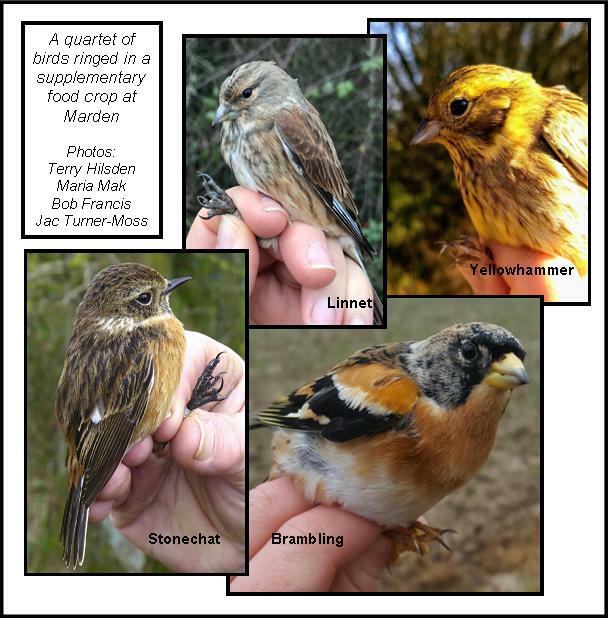 Recent ringing sessions there, for example, have demonstrated the way in which many birds fly long distances to find food. A reed bunting trapped and ringed in West Sussex only a few days before, was recently re-trapped in Marden. This shows that bird populations will continue to decline unless there are resources for them across the landscape, not just on tiny pockets of land in a few scattered nature reserves. So keep your eyes open on your next winter walk: who’s doing their bit for the birds around the Farleighs?